In this article, we will be covering an application which can be used to remove watermark from Windows 8. This application can also be used to modify the watermark and also change the build number displayed in the bottom screen of Windows 8. My WCP Watermark editor allows us to customize Windows 8 by personalizing texts around the desktop. This application can edit Windows 8 watermarks and also remove watermark completely if not required without changing your favourite theme. 1. Download My WCP Watermark Editor software from the link given at the bottom of post. 2. Install or copy the application to a folder. 3. Right click on the application and select Run as administrator. 5. Click Apply new settings. 6. Reboot your PC and watermark will be gone. 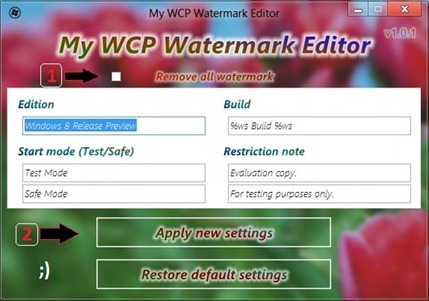 This free watermark remover will work on Windows 8 CP & RP editions and also compatible with x86/x64 versions. This trick doesnt wrk on developer preview versions of Windows 8.